Contains 5 popular screw sizes. Affordable, quality screw kit contains five of the most popular screw sizes for pocket hole joinery, and now comes in a new and improved case. All screws feature a self-tapping tip and deep, #2 square drive recess. 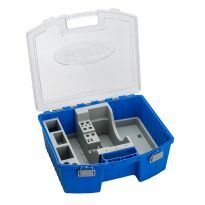 Kit contains 675 screws to tackle a wide variety of projects. The upgraded case is made with heavy-duty plastic and features a comfortable domed handle for easy transport. Use #6 x 1" pan-head fine thread screw when joining material to hardwood. For use in 1/2" thick stock. Use #7 x 1-1/4" washer-head fine thread screw when joining material to hardwood, such as hardwood face frames, attaching edge-banding, and cabinet walls to face frame. For use in 3/4" thick stock. 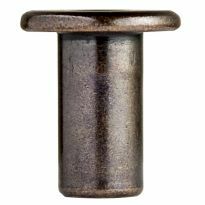 Use #8 x 2-1/2" washer-head coarse thread screw in both hardwood and softer materials. With Sun-Seal weather-resistant coating to greatly prolong outdoor life. Ideal for 2x4 construction, decks and outdoor furniture. For use in 1-1/2" thick stock. Use #8 x 1-1/4" washer-head coarse thread screw when joining material to soft or composite material. Works great screwing cabinet partition to floor, nail rails to partition, corner blocks, and plywood to plywood. 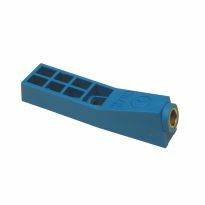 For use in 3/4" stock. Use #7 x 1" pan-head coarse thread screw when joining material to soft or composite material. Ideal for drawer boxes. For use in 1/2" thick stock. I have had one of my own for quite some time, bought this one for family of mine who are into wood, think they will love it as much as I. 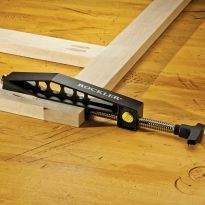 Great way to get started with the pocket screw jig. Screws are top quality. 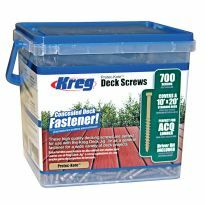 Kreg Screws for any occasion. The selection of sizes will fit most of my needs in the near future. Very good value, works as well as much bigger and costlier units. 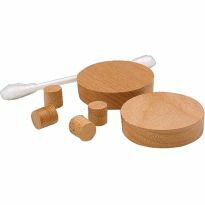 Very versatile, fits on most joint pieces. Great product! Easy to use, precise time after time. cuts time of assembly in half. Great selection of types most commonly used around the shop. Nice to have reliable sturdy supplies. I like organization too. the name says it all, have never split a board using them and they do as they are suppose to. I like the variety but bought this for the case. When out of my shop I can carry the screws safely in this case. Good assortment of Kreg screws. Price was good, and the shipping was fast, well packed etc. Just what you expect from Rockler. The variety of screws in this box suppliment the quality and effectiveness in their application. The sales price was to good to pass up on this convenient storage system for my Kreg screws! This is such a great deal especially when you end up needing different size pocket screws! This is perfect. I got all the screw types I need in one secure box. Easy to find and use. When I bought the K5 system I started to buy the 1 & 1/4 box of screws, but when I extrapolated out the cost of the box price as compared to the screw kit it was a no brainer. And I got a nifty carry case as well. Like the fact of have the right kind of screws when needed. When I am working on a project that uses Pocket hole screws, I can reach for this box to obtain the correct screw to use. Plus, it gives me the option of different lengths at my fingers tips. It also gives me a quick view of what length and type to buy the next trip to the store. Nice case of often used screws at hand when you need them. Nice case. Keeps screws organized. Hey, they're screws - but they do work great to ensure joints stay tight. Great addition to my kreg set. Good selection at my fingertips. When I purchased this, I thought just some more screws at a fair price, but these are really pretty neat. I have never used these before and I am thinking of getting another one or two of these for back up. Good product, good price!!! When the situation calls for this tool ;I think there's none better. A great item for a great price. Love the Jig and the kit is great to keep hardware organized. gotta have screws for the pockets ! Needed to replenish my Kraig screw supply. Love my Kreg Jig. I use it for everything I build. This case of screws is perfect for me. Need extra screws for a planned patio table top. comes with the most commonly used items. Needed the screws for a project. 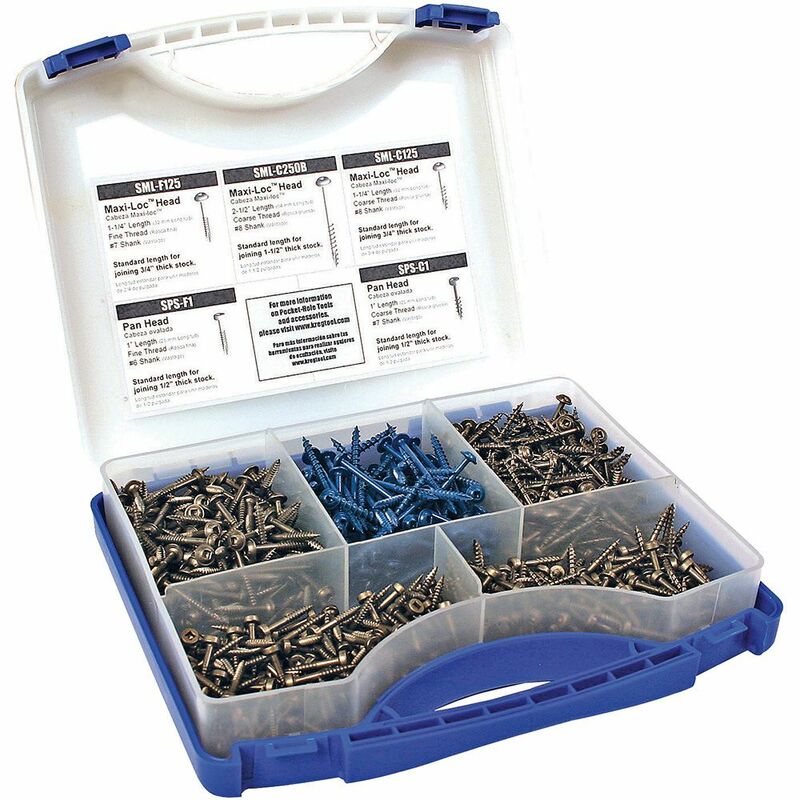 Good starting assortment of screws, case to organize them. 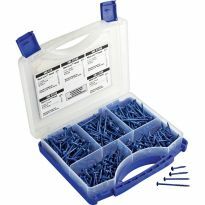 I am almost out of pocket screws and this is a good value. Ran out of them. Don't really care about the container which reviews don't rate very well, even though it would be nice if Kreg improved on that. Want the right stuff for the new Jig. 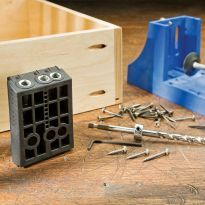 You can NEVER have enough screws, and this keeps them organized. Needed a starter kit for new jig. Needed to replenish my onhand supply. Increase my inventory of screws. To go with K5 Master System just bought. Didn't have any pocket screws on hand, and this looked like a good selection. Easy way to make face frames. Wide assortment for reasonable price. Seemed like good way to find out what to purchase next. Don't do many pocket holes, have the jig and needed an assortment of screws. This gives me selections different screws for the shop. Does it take a diferent jig for a #6, or #7, or #8 screw? BEST ANSWER: No, it uses the same jig. Can they be used for exterior purposes or with treated wood? BEST ANSWER: Certainly can be used but I have no idea about the rust factor. You should submit the question to the company for a more complete answer. My experience was not good when used for out door projects. Would recommend the Blue coated Kreg screws for out door use. 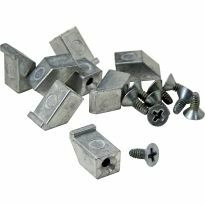 can these screws be used without the kreg jig? BEST ANSWER: Screws are screws so they can always be used in that context. 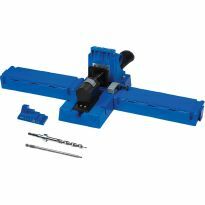 This is totally geared for a variety of applications in pocket joinery and they are suited for that. It would seem a waste not to use them in that context. Jigs are inexpensive and applications are endless. part of the head, presumably to avoid screwing them in too far. Yes they can, they are a very sharp, well made wood screw for your projects and you should remember some have large flat heads attached for working with soft woods. Yes they can, However they have a larger diameter head than normal wood screws have.